In the online media industry, it is equally critical for advertising professionals to monitor their own local rankings and validate their own geotargeting as it is for them to keep an eye on their competitions’ activities in different locations. One of the hottest markets in digital media is Germany and in order to accurately perform and validate online media monitoring there, a good German Proxy is required. For example, when searching Google for “travel deals,” local organic results show top rankings for travelzoo, priceline, kayak, and budgettravel (See Figure 1). However, since search engine rankings vary based on location, if you are targeting a specific market, it is important to also check your rankings there. If the marketing department at priceline, listed organically at #2 when searched locally from Los Angeles, is experiencing lowered traffic from German IPs, they could use a German proxy to monitor their rankings. 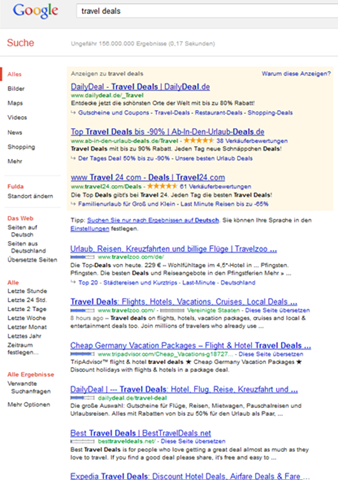 When searching Google for “travel deals” through a German proxy, the results are very different (see Figure 2). The top German results are travelzoo, tripadvisor, dailydeal.de, besttraveldeals.net, and expedia. This is a quick explanation for the lower traffic. To take it a step further, of course, the German proxy toolbar can also be used to monitor sponsored rankings. 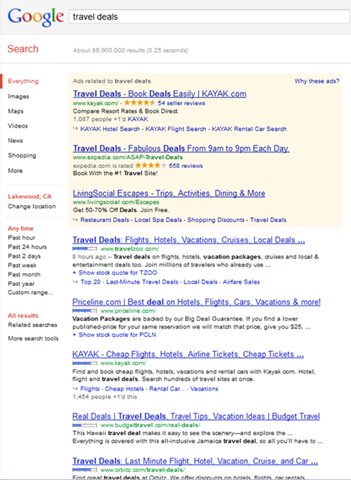 Priceline is not listed in the top sponsored results when searched from Germany either. Even more sophisticated marketers at companies like priceline or kayak could also use the proxy in Germany to validate their own content and marketing. Perhaps some poorly displayed content or geotargeted marketing could be a culprit as well. Checking kayak.com through the German proxy shows that the site is nicely geotargeted in the German language and set to show prices in Euro for the German market (see Figure 3). 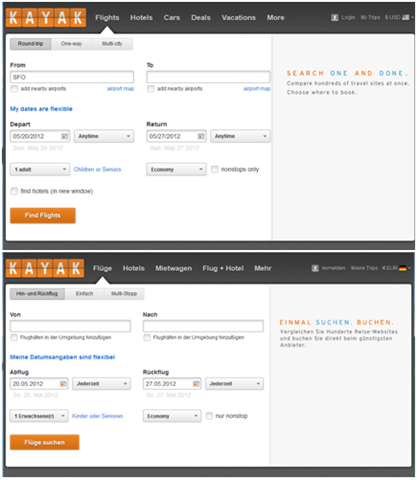 Online media monitoring research can even be taken a step further to examine what display advertising is run by kayak’s competitors in Germany. By browsing relevant sites through the German proxy, competing travel campaigns are discovered (see Figure 4). Now, the professional marketer has the required information to act. Perhaps a concerted effort needs to be invested in German SEO to improve organic rankings in the German market. This could easily be coupled with an investment in SEM for increased sponsored rankings. Finally, by exploring competing campaigns in the local market, they could decide how and where to run display advertising. In all of these aspects, the German geo proxy has proven itself to be an invaluable asset for online media monitoring, market research, and profiling of competitors. This is a guest post by John P, an online marketing enthusiast.